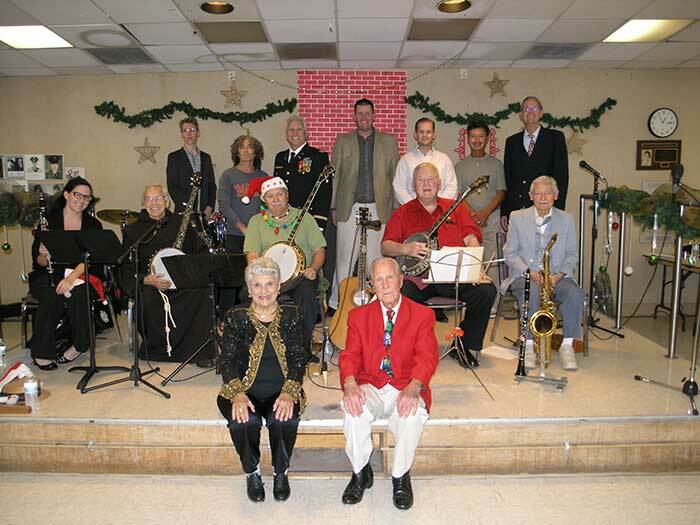 HUNTINGTON BEACH...Volunteers and care providers were treated to a Christmas lunch and music preformed by the Forever Young Band and concert pianist Danny Barrios at the Rodgers Senior Center on Thursday, December 17, 2015. The Forever Young Band is composed of members who are 80-years-old and up. One of its older members, Sid Hallburn, 92, gave the audience a sample of his tap dancing as did Polly Sloan. Hallburn is pictured in the above photo in the first row in the red jacket with Polly Sloan next to him. The band's first selection was Old Bones was introduced by Master of Ceremonies Craig MacDonald. Sloan, 90, tapped to Tea for Two, accompanied by musicians Jim, Tom, Glen and Maggie. Frank in military uniform remembers being in Viet Nam one Christmas when his mom sent him a 3-foot tree in the mail and the soldiers decorated it for Christmas. On Christmas they each had a hot meal when outside it was cold and rainy. The next night Frank was station on sniper duty in the rain and thought about his family back on Christmas, as many soldiers did during the Viet Nam war. The band concluded the first part with the audience singing Silent Night. The second part of the luncheon featured selections played by concert pianist Danny Barrios. To see Forever Young in action at Family Day at the Art Center October 11, 2015 click here for a short YouTube video.